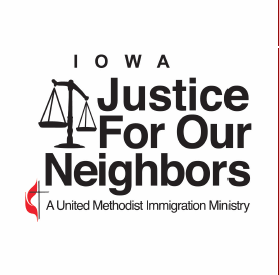 Each month the United Methodist Church sponsors 7 immigration clinics across the state, providing free legal services to Iowa immigrants through a program called “Justice for Our Neighbors” (JFON). Someday these families too will have those happy faces! Our district clinic is in Cedar Rapids at Lovely Lane Methodist Church. This year it has been overflowing with 15 or more client families each month and over thirty volunteers helping out. Even our childcare is full! And yet JFON has only two attorneys serving the entire state. Law school students often volunteer to help but cannot do so without supervision. Our church has close ties with the Cedar Rapids clinic. In August, our UMW provided the light meal that is served to volunteers and immigrant families, some of whom wait three hours to see the attorney! Kay Graber serves as Clinic Coordinator, Amy Guardado is the assistant, and Gabi welcomes families, greeting those who speak Spanish as their native language. The clinic has seen families from 101 countries, speaking many, many languages. We struggle to find translators for Nepalese and Swahili, but we get it done! Another plus for our world is the number of volunteers who come from area colleges. Iowa Wesleyan, Cornell and Coe bring vanloads of students to volunteer. Sue Deibner brings students from her MVHS Spanish class. The students LOVE it and we are nurturing a whole new generation of young people who “love their neighbors as themselves”. The JFON clinic is truly “transforming the world” for those who are clients and those who serve them. But it is desperate for funding. Even the October clinic had to be cancelled because of lack of funds and the inability to fill the vacant attorney position. The clinics rely on our Methodist churches for funds. Your gifts to this Oct. 22nd Special Offering will launch many refugees and immigrants on the pathway to citizenship!